9 comments | First published March 15, 2017 , last updated April 24, 2019 . Reading time: 7 minutes. We talked about the standard military cuts like induction cut and high-and-tight — now get ready for the striking crew cut hairstyle. If you’re usually short on time and can’t be bothered with caring for your hair other than the occasional touch-up with hair clippers, then you should consider this legendary style. Here’s a thorough break-down of hair clippers on the market. You’ll want to have a look at our Home TOP Choice© clipper for this haircut. Let us know if you agree with our pick! So, this haircut is a classic. It’s ultra popular with business people and teenagers alike as it carries a good amount of youthfulness but still gives off a serious vibe. Fantastic combination. The ease of maintenance sets it apart from hairstyles like mohawk or simply wearing longer hair that needs to be combed and takes a fair amount of time to keep in check. In this post, we’ll find out where the crew cut comes from, how to do it at home, and at the end, see some photos of crew cut. 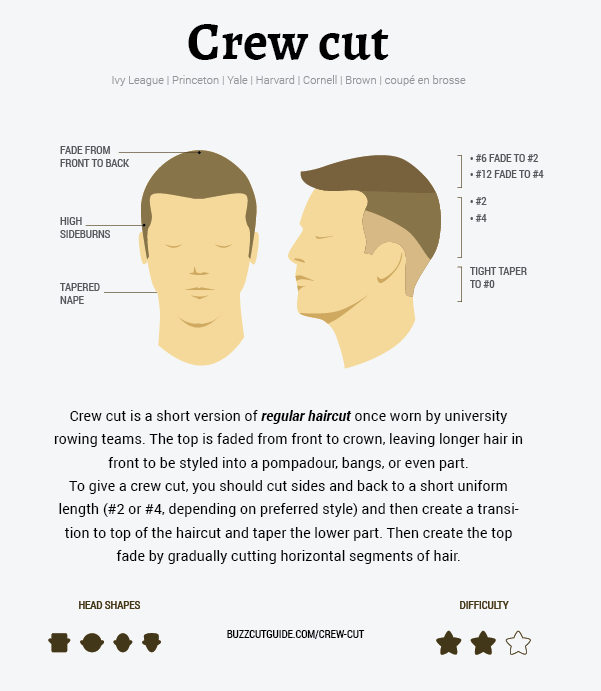 The classic crew cut is a masculine haircut once mainly worn by American university rowing teams. Its main feature is short faded hair on the back and the sides, and longer length on top. Its scholarly origin is the reason there are so many different names of this haircut that are named after universities (Ivy League, Princeton, Yale, Harvard, Cornell, Brown). 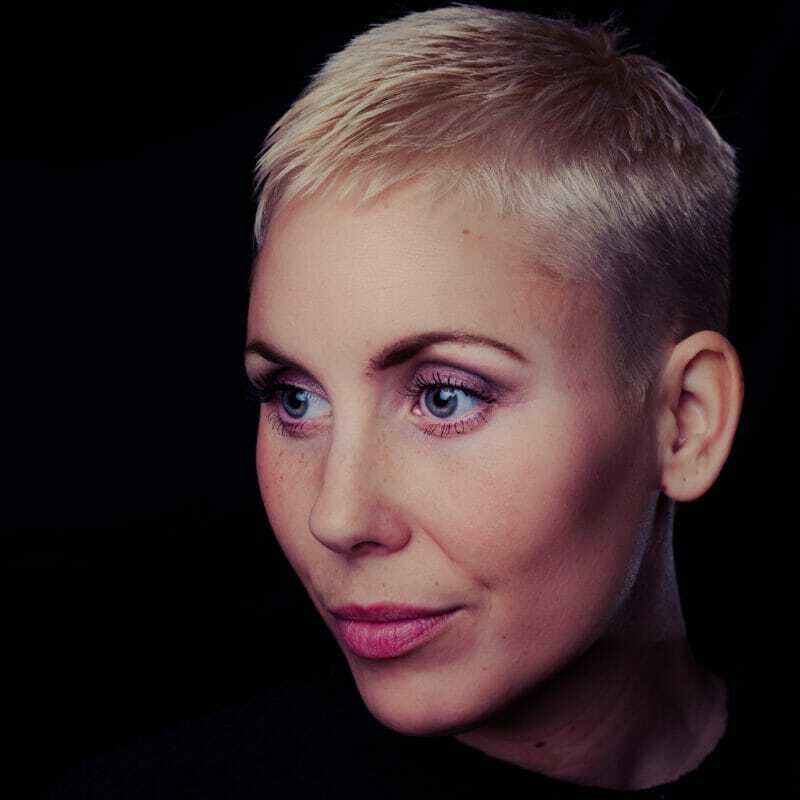 If you want very short hair, but don’t want it to be a basic buzzcut, then the crew cut hairstyles are the thing for you. This cut demands little care once it’s done. It’s perfect for those who don’t like to spend too much time styling your hair. 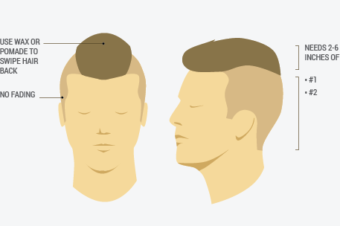 Who is this haircut for? This cut will work well for any head shape and all hair types, but it’s more recommendable for thicker hair. The standard crew cut is cut by buzzing the sides and back with a hair clipper and then fading the transition between the top and the sides. The haircut is pretty flexible, allowing you to cut a long crew cut or a short one. If you’re not into cutting your own hair, can get it at the hairdresser’s the first time. It’s not too hard to touch it up at home after 2 weeks and make it hold its shape just a little longer. Maybe you’ll eventually feel more confident in your skills to completely do it yourself after touching it up a few times. For this haircut, it is even more important than with other buzz cuts that you look through some reference photos and try to imagine how you will cut your hair. Spend some time in front of the mirror, see your hair growth pattern, and try to visualize how you would cut it with clippers. This haircut requires a great deal of crew cut fading, which is difficult but not impossible to do at home by yourself. You will need a comb, a pair of scissors and multiple guards and blades ready. 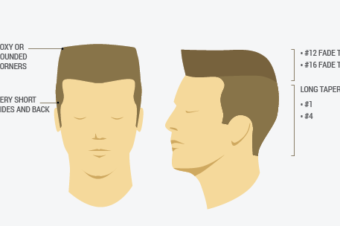 To do a crew cut, you will need to cut sides and back to a short uniform length (#2 or #4). Ask a friend to help or simply use a second mirror to see what’s going on at the back. You’ll get a hang of it in no time. Work from bottom up, starting on one side of your head, then do the other, and only then cut the back. This will ensure you remember what you did on the first side. You’ll want to clip in the opposite direction of your hair growth pattern, especially if you have thin hair. If you’re unsure what is your growth pattern, carefully buzz in every direction. Depending on your hair length, you’ll likely want to shorten the top as well. You can do that with clippers using large plastic guides that typically don’t come with the clippers but can be purchased separately. Alternatively, use scissors to shorten your hair on the top. This is an optional step if you’re simply touching up a professionally-cut crew cut. Create a transition from the bottom to the top of the head and taper the lower part by switching to a guard size in between the one used on the top and the one on the sides. This is perhaps the hardest thing to master, so don’t rush. As you did earlier, work on one side and then the next, and only then focus on the center, all from the bottom up. This will help you create a uniform cut. You can find more on this in our tutorial on cutting your own hair. Before rushing to cut the top, make sure the back and areas around your ears are even and look good. The top will be the most visible part of this cut, and depending on the length of your hair you can get very different results. You fade the top from the front to the crown. The hair will be longer at the front. You can later style it into a pompadour, bangs, or even a side-swept crew cut, depending on your hair length and structure. After you’re done with sides and back, create the top fade. Decide how long you want that segment to be. Then, gradually start cutting horizontal segments of hair with different guard sizes. Make sure the transition between the bottom and top is smooth. Alternatively, you can also use a pair of scissors to trim your hair or to do the final touch-ups. Are the transitions in your cut too obvious? Do you need to fix the fading? Or, are you simply a perfectionist and want to make sure your cut is uniform and well done? Grab a pair of thinning shears! They can be great for fixing mistakes. They work because the cuts they do aren’t obvious and so can blend out pretty well. Place the scissors horizontally in the ”line” that you see needs blending and do a quick snip with the shears. Stick with them to help you fade any transitions you weren’t quite able to get right. You can also run them horizontally bottom up around your head and on the back for a smoother taper fade. If the top of your haircut still has too much volume, you can use the same type of scissors to take some of it out or alternatively, resort to side-parting the hair. You can style this haircut quite easily with some wax or gel for a matte finish or leave it as it is. This cut is pretty low-maintenance, you’ll need to refresh it regularly as all short men’s haircuts. Putting some effort in styling it will also increase the duration of the cut and will make it look neat. Do keep in mind that very short is prone to sunburns. Due to the skin fade, there is a lot less hair covering your scalp. Sun rays will get to you unless you use sunscreen or wear a cap on sunny days. I have been cutting my own hair for probably around 30 years and I have not looked back. Normally I do a crew cut with a size #2 at the sides and a size #4 at the top, which I taper. The trick for tapering is to let the clippers stay flat on the sides and as you reach the desired spot you actually lift the clippers in an upward motion, so you don’t actually go through with the cut. Imagine what I have saved over the years. Happing clipping!! 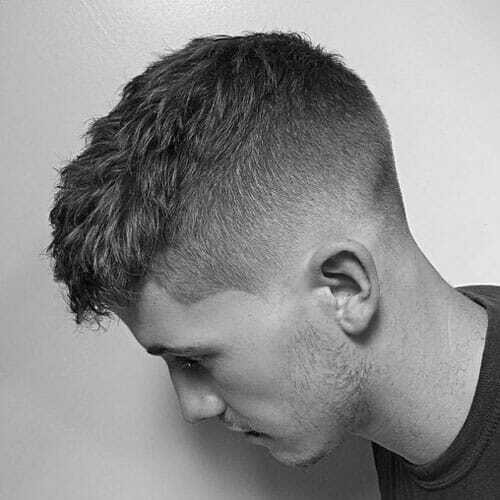 How can I get perfect cut at the back of the head? 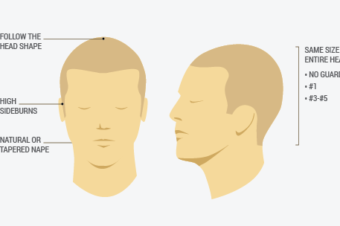 If you’re doing a crew cut and you don’t need/want fading, then just use the same guards all over your head, up and down, not leaving any space uncovered. This way you’ll make sure all the hair is at the same size. Cool style, but this will really be difficult and time consuming to achieve by oneself. The first few times you cut your own hair is usually a bit daunting, and you will want to take it slowly, but you get into the swing of it pretty quickly. Give yourself 45min at first, but after a few times it take like 15min tops. In my experience that’s usually less time than it takes to drive to the barber, sit around for your turn and get your hair cut. Just make sure that your lowest setting is a length that you don’t mind having all around and you’re good to go. I agree. The first time I tried to do this it took almost an hour and looked pretty bad. The second time it took about 20 minutes and looked better than 80% of haircuts I had gotten at a barber. where the symbol ‘# ‘refers to? ‘#’ means ‘number’, as in number four (#4) guard attachment.